We woke feeling tired and stiff but somehow refreshed. Don’t get me wrong, I still felt grungy but its amazing what a nights sleep will do to rejuvenate the body and mind. As we packed up, no sooner did we get the tent in the backpack, did it start to rain. On went our rain gear, pack cover… oh yeah, and our bug nets. The descent of Puzzle Mtn was steep-a lot of down, ~2,400 ft drop to be exact. No wonder my knees were smoked by the time we made it to the road. It was here that we would need to make the decision a) hike 11 miles up the road to our car and hope for a hitch, or b) commit to finishing the loop. My brain tallied the miles over and over, almost wishing for a way out. I could have been swayed to walk the road back to the car…I left it up to John. Asked him what his gut told him…press on, it said. The road walk wasn’t bad, less bugs than the trail and the rain was reduced to a delicate sprinkle. Thank you to the landowners that allow hikers passageway, making this loop possible. From here, the trail followed a snow machine trail with a suspension bridge (yikes) and old woods roads. Back into the woods and up, up, up we went. The rain started to fall again, a little more than a sprinkle this time, and I was over heating. Slowing my pace didn’t help 100% humidity-yeehaw. I also started to get the lower stomach sensation again as we were climbing and continued till we got to camp. What is going on? Made it to camp and set up the tent to get some relief from the rain and bugs. We were grateful to find tent platforms- meaning we didn’t have to set up on the wet ground and a bear box- no need to hang! 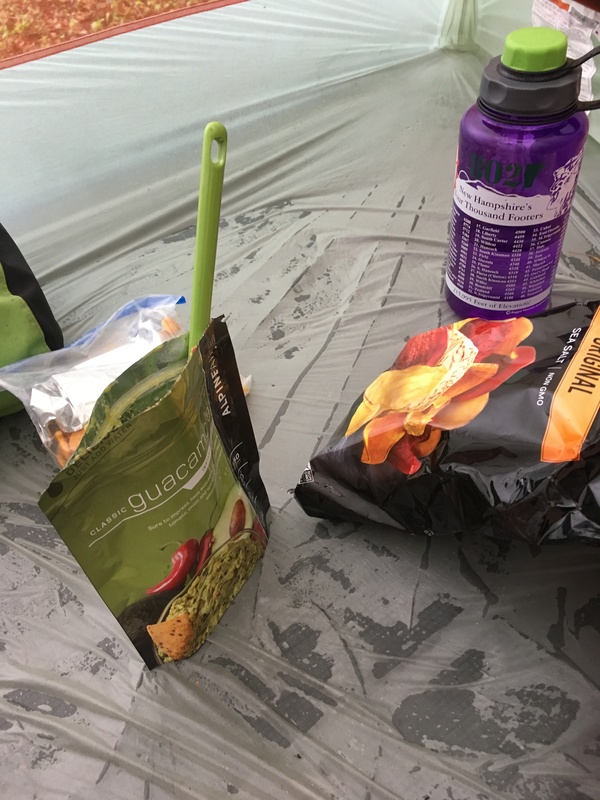 We hunkered down in the tent, made guacamole from Alpine Air (highly recommend) and enjoyed the remaining terra chips. Yum!